The Physics and Mathematics of Electromagnetic Wave Propagation in Cellular Wireless Communicationdescribes the electromagnetic principles for designing a cellular wireless system and includes the subtle electromagnetic principles that are often overlooked in designing such a system. This important text explores both the physics and mathematical concepts used in deploying antennas for transmission and reception of electromagnetic signals and examines how to select the proper methodology from a wide range of scenarios. 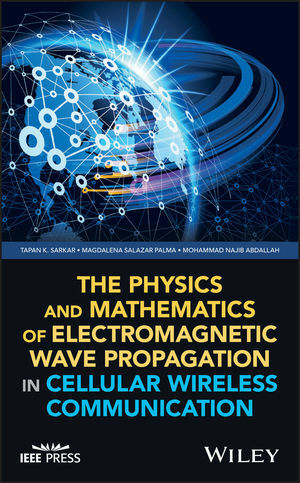 Written for engineers, researchers, and educators who are or plan to work in the field, The Physics and Mathematics of Electromagnetic Wave Propagation in Cellular Wireless Communicationoffers an essential resource for understanding the principles underpinning wireless communications. Tapan K. Sarkar, PhD, is a professor in the Department of Electrical Engineering and Computer Science at Syracuse University, New York, USA. Magdalena Salazar Palma, PhD, is a professor in the Department of Signal Theory and Communications at Universidad Carlos III de Madrid, Spain. Mohammad Najib Abdallah, PhD, is a researcher at Syracuse University.